Building a rapport in Mosul, and adding members to Sons of Iraq in Warij. 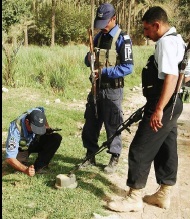 Operation Arrow Cleanup, a joint effort with IP clears a town in Diyala. After rehabilitation, some detainies are released to their families in a reconciliation effort. Sgt. 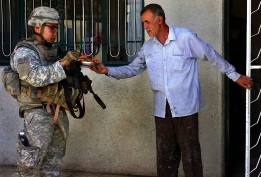 Eric Lee, assigned to 8tht Inf Regt, is offered a snack by an Iraqi gentleman during a patrol, April 21. Pvt. Justin Stougard stops to greet a young resident. Spc. Tracy Collins and Spc. 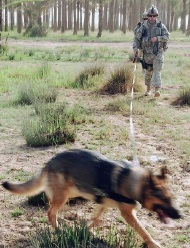 Martin Cerrillos patrol the al-Wadah neighborhood. 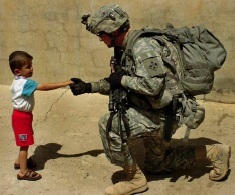 Cerrillos takes the time to shake hands with a young Iraqi. 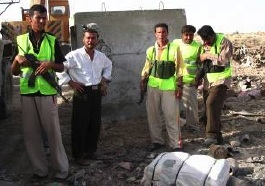 BAGHDAD – One hundred and fifty residents of Warij volunteered to become SoI, April 12. 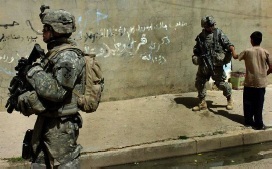 First Lt. Dan Henry, an EO under 8th Cav Regt, said criminals have threatened business owners in the area and used Warij as an area to coordinate and execute attacks against the GoI, CF and Iraqi SF. differences for Warij to be a safe community. Coalition force leaders hope the example in Warij of Sunni and Shia working together will encourage citizens who fled during the violence to move back to their homes. “The importance of this program is that it will enhance the perception of security to where families will return to their homes and establish another multi-ethnic, multi-tribal and peaceful population center in the Spartan (2nd BCT, 3rd ID) operating environment,” said Maj. Rob Kaderavek, 6-8th Cav. Regt. EO. 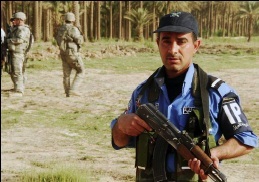 Sons of Iraq in Warij stand guard at a checkpoint, April 22. 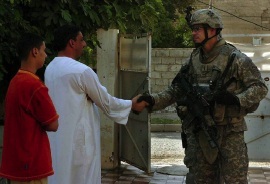 The Warij SoI program is composed of both Sunni and Shia residents. entering a palm grove near Hib Hib, April 23.
the Hib Hib area in the Diyala province during the mission. BAGHDAD – The 4th Bn, 64th Armor Regt, attached to the 1st BCT, 4th ID, seized 3 anti-tank RPG launchers and 10 high-explosive RPG rounds in the Rashid district in southern Baghdad, April 21. Soldiers from Co C, 4-64 AR, with help from their Iraqi SF counterparts discovered the weapons cache. 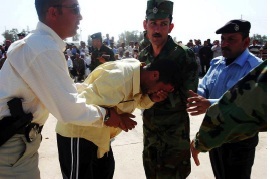 Kirkuk Police assist a family member overcome with emotion during his brother’s release at the Kirkuk Police Academy in Iraq. A total of 122 detainees were released April 21 during a ceremony marking the biggest release to date in this region. A detainee hugs his children following the detainee release ceremony. BAGHDAD – April 22, Soldiers from 4th BCT, 10th Mtn Div, witnessed a criminal emplacing an IED in northeast Baghdad, and shot and killed him. UAV operators from 3rd BCT, 4th ID, spotted 2 individuals with a mortar tube. They loaded the weapon into a vehicle and drove off in northeastern Baghdad. The UAV fired a hellfire missile, killing 2 criminals and destroying a vehicle. Soldiers from 1st Sqdrn, 2nd Stryker Cav Regt, attached to 3rd BCT, 4th ID, engaged and killed a criminal after coming under a small-arms fire in northeastern Baghdad. Soldiers from 3rd BCT, 4th ID, were attacked with an IED by criminals while they were conducting a mounted patrol in eastern Baghdad. Soldiers were then attacked with RPGs. Soldiers identified the criminals’ location and engaged them with small-arms fire, killing 6 criminals. Soldiers from 3rd BCT, 4th ID, were attacked with RPGs in eastern Baghdad. They identified 2 separate RPG teams and retuned fire, killing 5 criminals.